George Vella is set to become Malta's next president, Prime Minister Joseph Muscat confirmed on Tuesday afternoon. In a tweet, Dr Muscat said that he was nominating his former Foreign Affairs minister to be Malta's next head of state. He will be Malta's 10th president. Malta's president is nominated by a simple parliamentary majority, meaning Dr Vella's ascent to the post is now all but a formality. Dr Muscat said that the nomination had the unanimous approval of cabinet and the Labour Party's parliamentary group. "I am sure Dr Vella will be another unifying figure for our people and country," his tweet read. In a short video statement, the Prime Minister said Dr Vella was a man "of absolute integrity", whose career had not been mired in controversy. His international experience means he can contribute to discussions on Malta's role in the international sphere, Dr Muscat added. Dr Muscat also thanked President Marie Louise Coleiro Preca, saying she served with unmatched energy. She was a symbol of unity, he said. 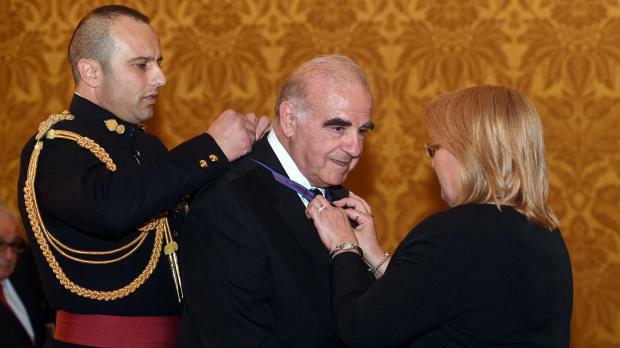 In a statement, the Labour Party congratulated Dr Vella and highlighted his integrity and international acumen, while thanking President Coleiro Preca for her "impeccable" work. President Coleiro Preca, whose term comes to an end on April 4, endorsed the nomination. "I am truly convinced that George Vella is indeed the right person to serve as Malta’s next President," she wrote on Twitter. I am truly convinced that @GeorgeWVella is indeed the right person to serve as Malta’s next President - carrying out sterling work for the benefit of our country, and being a unifying figure for the people of Malta and Gozo. Dr Vella's nomination was also praised by MEP Alfred Sant, who, as Prime Minister, had had Dr Vella as his deputy. The nomination, he said, was expected and well-deserved. Dr Vella had continuously proven his ability, intelligence, attentiveness and tolerance. Dr Sant said he learnt a lot from Dr Vella as he saw him take decisions in favour of Malta and the Maltese, without any sign of partisanship. Whenever he was faced with difficult decisions he took them courageously and honestly. He said he was convinced that, as President, Dr Vella would again distinguish himself through his sincerity, sense of justice and wisdom and would be an agent of genuine unity. Dr Sant also thanked outgoing President Marie Loiuse Coleiro, who, he said, carried out her duties with commitment and in an impeccable manner. She gave the post of President a social dimension and showed that the position could provide the country with guidance. The people, he said, should be grateful. The Opposition was less enthused by Dr Muscat's choice. In a statement, the Nationalist Party said that its MPs would be meeting to discuss Dr Vella's nomination. It nevertheless said that the Prime Minister had missed an opportunity to look past partisan interests and pick a head of state which two-thirds of parliament favoured. In the past months, PN leader Adrian Delia had openly called on Dr Muscat to nominate a Nationalist-leaning president, suggesting Lawrence Gonzi, Tonio Borg or Louis Galea as candidates. Partit Demokratiku said Dr Vella was a capable politician but said that in the context of the present political scenario it would have been prudent had someone perceived to be close to all citizens of Malta and Gozo been chosen. In a separate tweet, Dr Muscat said that cabinet had unanimously resolved a vote of thanks to President Coleiro Preca "for her sterling work". "We are glad that she will continue with her contribution towards Maltese society through the Foundation for Social Wellbeing," Dr Muscat wrote. The tweet pointedly did not refer to President Coleiro Preca's current role at the helm of the steering committee for a Constitutional convention. Rumours about her replacement have been swirling for several weeks, with Dr Vella the acknowledged favourite. Dr Vella, who will be turning 77 next month, had already been touted as a favourite to take over the presidency five years ago, only for the Prime Minister to opt for Marie-Louise Coleiro Preca instead. A doctor by profession, Dr Vella has had a long career in Maltese politics, serving as cabinet minister in two separate legislatures and deputy prime minister in one. He joined the Labour Party in 1976 and was elected to parliament for the first time two years later. That was the start of a parliamentary career which would stretch into seven legislatures, with a hiatus in 1987 when he served as Malta’s permanent representative to the Council of Europe after missing out on a parliamentary seat. His appreciation for global affairs led the Labour Party to make him its spokesman on foreign affairs in 1992, and he served as minister with that portfolio on two occasions: first between 1996 and 1998, serving under Alfred Sant - when he also served as deputy prime minister - and again between 2013 and 2017 under Dr Muscat. In 2017, he was made a companion of the National Order of Merit. As a Member of Parliament, he represented the 3rd and 5th Districts. Born in Żejtun, and an alumni of De La Salle college, Dr Vella is married and has three children and seven grandchildren.